Eatthehipster: mainly meditations on wine and bitchy art reviews. Update 2018: what a difference a few years makes. No one admits to being a banker anymore (except in NYC), so the collective loathe can focus on hipsters; the politics (not least in Italy) are well toxic, verging on the chaos of Carl Schmitt’s nightmares; icebergs are calving apace…but as Liam Gillick’s has it (outside Bar Laika in NYC) bibamu smorien dumest! 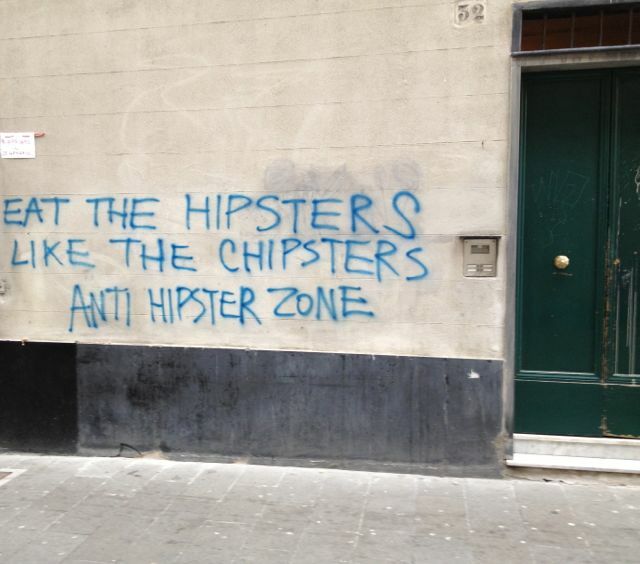 On the title: “hipster”, when this blog was started in January 2013, was word-of-the-moment in Genova. Though, as of 2015, the hipster look hadn’t quite hit Genova in force (fixed-gear bikes seemed to come unstuck on medieval cobbles and the bravos at the port made quick work of any metros they found). However, pleased to see hipsters still happily infest the gentler climes of London’s Broadway Market: gelled hair and beard a la King George V, rolled trousers, hand-crafted work boots, etc., thoughtfully sipping artisanal coffee and rolling cigarettes.